Home » Features » Dr. Bob Tice: Please Don’t Make Me Read the Genealogies! Dr. Bob Tice: Please Don’t Make Me Read the Genealogies! I’m a part of this Advent line because a former house burglar named Greg shared the marvelous story of his new Advent family with me. Most people either flat out avoid reading the genealogy of Matthew at the beginning of his gospel, or they approach it like they would cod liver oil—nose held and eyes half closed. Besides the many names that are difficult for most of us to pronounce, the long list of names seems boring and unrelated to the birth of Christ. “I’ll do anything, Lord, but please don’t make me read the genealogies!” most of us would say. A genealogy tells us who we are. It tells us what kind of family we are considering getting ourselves involved with. A genealogy gives us our bearings. In this season of Advent and Christmas, Matthew 1 challenges us: if you enter this Advent family, here is who you are, who you will be, and what you can expect. Christ’s genealogy can remind us of four truths that, if we take the time to discover them, can enrich our lives this season. We need to remember that we are part of the Advent family line because of someone else. This family line goes all the way back to Abraham and Sarah, who courageously broke away from one family line (the Chaldean line of Ur) to start another line. Isaac then had the opportunity to enter because of Abraham and Sarah. Rebekah had the opportunity through Jacob, and Jacob and Rachel had it through them in turn. I’m a part of this Advent line because a former house burglar named Greg shared the marvelous story of his new Advent family with me. Now a whole new branch of the Tices has become part of the Matthean genealogy, as my children have responded to Christ through my witness. We need to remember that our lives will be full of the challenge to walk by faith into the unknown. 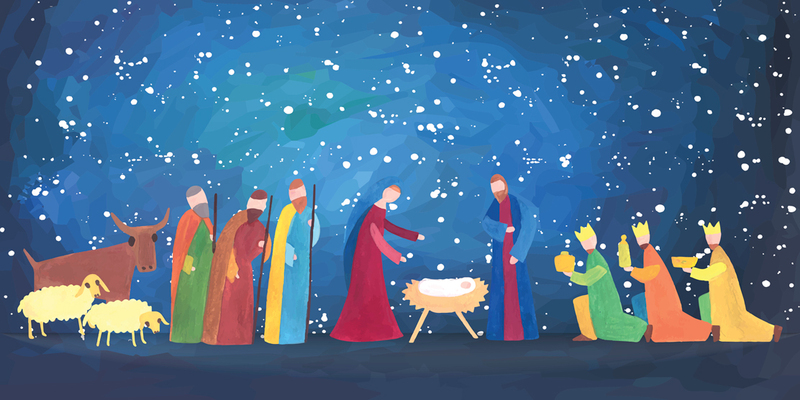 Many of the members of this Advent family are like Abraham, the first name in the genealogy. Abraham was called out of Ur—our of his comfort zone, out of his family’s surroundings and culture. What was Abraham called to? “To a place I will show you,” says Gen. 12:1. In other words, not only were Abraham and Sarah called away from the familiar, but were given no highly detailed road map describing every twist and turn to their new destination. Faith is the absolutely non-negotiable human action necessary for the divine action of God to be regularly at work within us and through us. Being in this Advent line means we will allow God to direct us, often through the unknown. We need to remember to expect the unexpected. Four women are mentioned in Matthew’s genealogy. Listing women in a Jewish genealogy is not the usual practice. What women they are! They are not the great matriarchs of Israel’s history—like Sarah, or Rebekah, or Esther. Rather, they’re women like Rahab, who had been a prostitute of evil Jericho. Out of the shame of Rahab’s past, God saw a woman who, unlike the others of Jericho, finally recognized the true God. Rahab was the only one who said, “For the Lord your God is he who is God in heaven above as on earth beneath” (Josh. 2:11). The red cord—a sign of her own sin and defilement (and, of course, of the seedy men who used to climb up it)—now became a sign of her salvation. In addition, every one of the four women listed here in a Jewish line were Gentiles: Tamar and Rahab were Canaanites, Ruth was a Moabite, and Bathsheba a Hittite. This family line overcomes some of the great prejudices of Far Eastern history! Joining this Advent family means expecting the unexpected and having the unexpected asked of you. We need to remember that our lives are kept by a promise-keeping God. This family line—just from Abraham to Jesus alone—is some 2,000 years old. Through tens of thousands of challenges, God fights to keep this family together and intact. By Matthew 1:12—just before Jeconiah, at the time of the Babylonian exile—there was just one surviving possibility to keep the Davidic line alive. The only possibility rested with Zedekiah (2 Kings 24) and he was in exile with his eyes put out. Yet God worked things out. The genealogy that we often avoid reading can remind us of the family line God is creating. It can remind us of our place within it and our commitment to invite others to join the family. Bob Tice, DMin, is pastor of RiverRock Church in “core-city” Buffalo, New York. He is also an adjunct professor with Northeastern Seminary (Rochester) teaching the course Theology of the City. This article, reprinted with permission, was first published in the Gospel Herald (Dec. 23, 1997) when he was Mennonite Board of Missions urban ministry director, pastor of Westward Church of the Living Word (Buffalo), and adjunct professor in Houghton College’s pastoral and church ministries program.